Genie Thiergartner has been playing professionally in the Greater Cincinnati area since 1985. She received her Bachelor's degree from DePauw University and a Master of Music from the College-Conservatory of Music on the University of Cincinnati. She currently lives in Liberty Township. 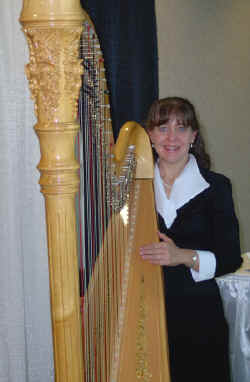 As a freelance harpist, Genie has added an air of elegance to many weddings, services and parties. 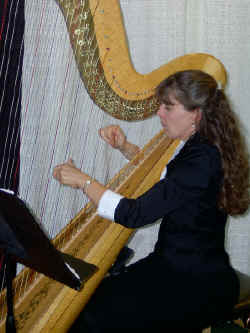 While the harp is often paired with a flute, it can blend well with may different instruments. In a recent wedding, Genie teamed up with her husband Fred on steel drum, timpani and other percussion along with an organist, guitarist and vocalist. Genie is the principal harpist of the Springfield Symphony Orchestra, the Richmond Symphony Orchestra, the Middletown Symphony Orchestra and the Hamilton-Fairfield Symphony Orchestra. She has also been a substitute in the Cincinnati Pops orchestra, the Cincinnati Ballet Orchestra, the Cincinnati Chamber Orchestra, the Dayton Philharmonic, and the Evansville Symphony Orchestra. In these groups she has backed many artists, including Doc Severinson, Crystal Gayle, Ray Charles, Charlie Daniels, Jim Brickman, Neil Sedaka and Dennis De Young. Genie has also played at various church services and performances. She was featured on WMOH radio in December of 2003 during the weekly recording of the service at Zion Lutheran Church in Hamilton, Ohio. The Christmas Oratorio by Saint-Saens was performed. In March of 2003, Genie and her husband, Fred, entertained and educated preschool children of the Lakota Early Childhood Center. Genie's harp is a Venus Classic made by W&W Instruments in Chicago. The design of the harp consists of delicate roses at the top of the column and base.